Back in the grind, as we promised to share some specific features from this year’s Ignite conference. And some exciting keynotes indeed! This time it’s from the thriving cloud faction, OneDrive & SharePoint. We’re talking: additional security measures, new design and “theming”, new company branding, universal search, new administrator capabilities, etc.. Interestingly, the future of the two looks very, very promising. Smart people picker. OneDrive and SharePoint will automatically make sharing suggestions based on previous sharing & communication preferences. This is valuable when you have a large directory. Link open receipts. Get a notification when a recipient opens the shared link. No more playing the “waiting game” wondering if the document had been viewed. Password protected links. You can assign a password to documents when sharing; and the recipient must obtain that password when opening the file. Quite like a file-level password protection, but at the sharing level. Block downloads. Prevent users from downloading & copy and pasting documents. Sharing from OneDrive mobile apps. The FULL sharing experience you have on desktop and online, now available on mobile apps. Sharing from Word, Excel, PowerPoint mobile. 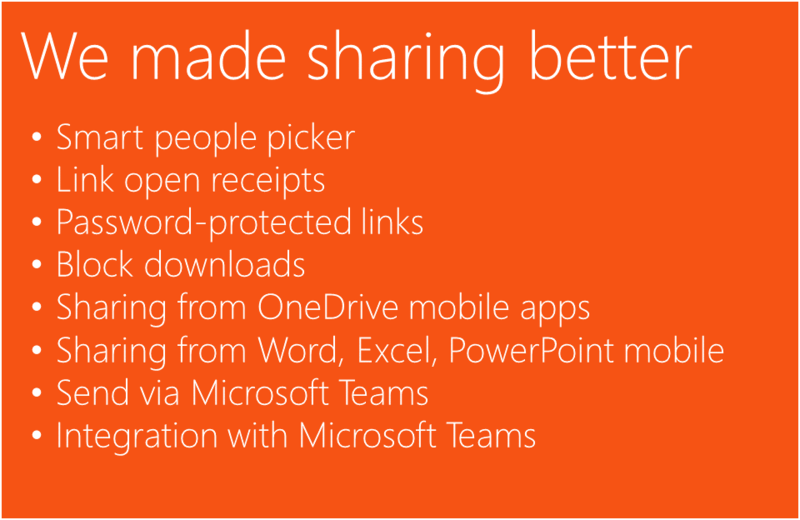 Full sharing experience from Office mobile apps. Send via Microsoft Teams. You can share a file with the full sharing experience directly from the Teams conversation. Integration with Microsoft Teams. This announcement was a bit confusing. The preliminary understanding is that you will have direct access to your OneDrive & SharePoint content in the Files section of Teams, and that you will have the full sharing experience. Comment on all file types. Comment and share on any type of file even if they are not Office files. This includes comment email notifications that take the recipient direct to the section/paragraph/location in the document where the comment was made. This capability should be released by the end of 2018. Company branding in sharing email. Company branding (i.e., logos) configured in Azure AD appears in OneDrive mail notifications. The capability is available now. Automatic sharing reminders. OneDrive detects when a recipient misses a sharing link and automatically sends a reminder email to the recipient (and sender) after 7 days. This functionality, available now. One-Click access request approval. Review and approve access requests without leaving Outlook. Outlook then recognizes OneDrive & SharePoint access requests, and turns them into actionable messages. The functionally is available now in Outlook on the web & Outlook Windows desktop application. Most, but not all are expected to roll out in the next few months or so – and we’re excited to dive into more (hidden) features to help you work better. Stay tuned. Ask us about storage, migration, & intelligent collaboration! Have our MS Cloud Experts assist in building a safer, more optimal business environment for you.